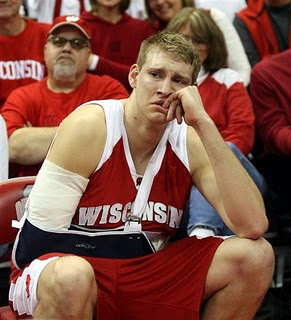 Polar Bear + MVP= WTF ~ The Bucky Channel - The World of Sports from Wisconsin's Perspective. So guess what people, this is the face of the NBA Development League. I hope to God they don't expect this to draw in viewers. Brian Butch took home the MVP honors Saturday in the NBDL All-Star Game. I didn't even know they had this game, but they did play Saturday afternoon. Mr. Butch did have a nice game though, finishing the game with 18 points, and 13 rebounds. He represented the West team as they beat the East 98-81. Butch is averaging just over 16 points, and just under 9 rebounds a game for the Bakersfield Jam. He was joined by a few semi-recognizable faces in Mustafa Shakur who played college ball in Arizona, as well as Joe Crawford who played at Kentucky. The East had Cartier Martin who played for Golden State this year when they had all those injuries. The only reason I know this is because they played the Bucks during that four game period. They also Earl Barron who played a lot for the Heat last year, but now is playing in Development All-Star games. Good to see Butch still going after his dream of playing in the NBA. Maybe this award will help those chances out, because I am sure a lot of people saw him play that day All-Star game. Well maybe not, but either way he can put this trophy in his case. If I was a betting man I would say this will be final highlight of the Polar Bears Career. Okay, Seriously, What's Going on Here?